Fair week is over. 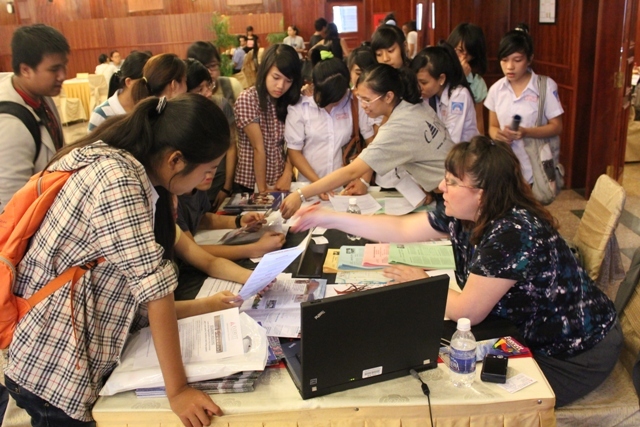 The fall 2011 StudyUSA Community College Fair series started on a Sunday in Ho Chi Minh City (HCMC) and ended on a Saturday in Hanoi with stops and high school visits in between in Nha Trang (first time ever) and Danang. These US community college-only fairs are unique in Vietnam, a wise choice for CCs that are serious about Vietnam and don’t want to get lost in the mix at the mega-US higher education fairs. Participating schools can be sure that most of the people coming are interested in a CC experience. It all seems so quaint yet so meaningful rewarding and effective. 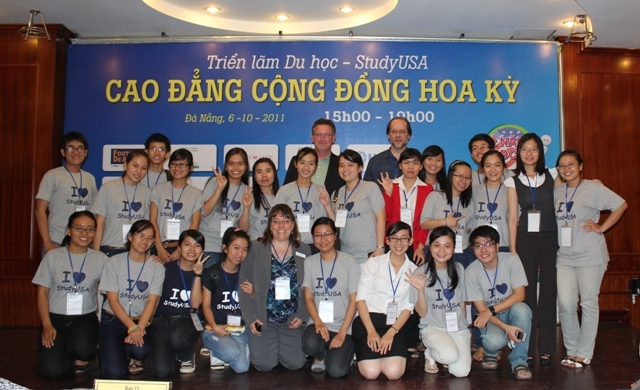 You create the conditions to bring people together – US colleagues from 12 states and students/parents from all three regions of Vietnam – so that they can talk about the advantages and benefits of studying at one of America’s most popular institutions of higher education, a community college (CC). While there are many reasons why a student/parent chooses a particular school, including location, cost, transfer opportunities, safety and scholarships, one key reason is the connection they make with the CC reps sitting behind the table, the face of their institution. Are they friendly, open, caring and patient? Are they service-oriented? Do they make young people and their parents feel welcome and truly enjoy interacting with them? Do they “connect” with the people who come to them with questions and a sincere desire to learn more? The extent to which the answer to these questions is “yes” is the extent to which these face-to-face meetings could be deal makers. Fairs as a example of “helicopter marketing,” in combination with other long-term types of marketing and promotion, remain an important means of student recruitment. Once students jump over the various bureaucratic and financial hurdles and finally arrive at their school of choice, however, the challenge is for the institution to deliver on the promises made during and after the fair. Note: Vietnam ranks 2nd in international enrollment at these two-year schools, a gateway for four-year colleges and universities for most Vietnamese and other international students. 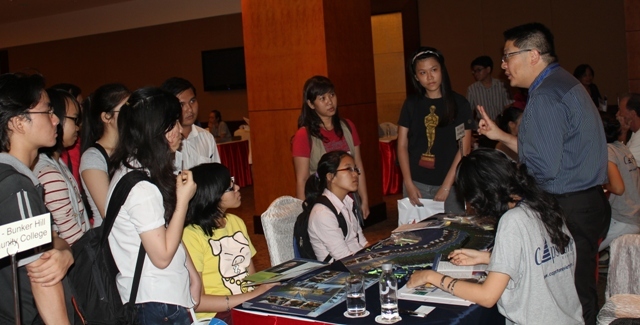 Disclosure: This fair series was organized by Capstone Vietnam, of which I’m managing director.